I really enjoyed stepping outside my usual approach toward planning music lessons to incorporate the comfort of a children’s book in my class time. I have witnessed my former mentor teacher using books that accompanied sing-alongs and have found that there is something so pleasant about sitting around in a “story circle”, looking with giant, awe-filled eyes at the book pages while singing. It is a magical thing. With that image in my mind, I picked up a book called The Singer in the Stream by Katherine Hocker and Mary Willson and immediately envisioned a classroom of elementary or secondary students staring at its beautiful artwork and fact-filled pages with excitement. The most exciting part to me, though, is the topic of the book. This book sheds light about the American dipper, a bird known for its long, complicated songs that can be heard over even the roar of a waterfall. The reason the dipper can produce a healthy forte sound for such a long time is because it can sing while breathing both in and out! After reading the book with my class, I imagine us researching the dipper’s song and discussing the different aspects of the glorious music it makes. What is the pitch range? Is there a distinct rhythm or tempo to its song? Does it have a clear melody? What is the texture and tone of the bird’s voice? This study and discussion would open students’ minds to the beautiful sounds of nature we so often tune out. This could lead to a great outdoor activity where we retreat in nature and listen for sounds that could easily be missed if one were not truly listening. Students can describe every sound they hear and collect audio samples of them. This can turn into a great musical composition assignment that could be an individual, small group, or whole-class project. I love how this book goes across to another subject area- reading and science- and also encourages observations of the world around us- after all, that is what inspires us to make and create music! What an inspiring reflection, I especially like your description of the students, “looking with giant, awe-filled eyes at the book pages while singing”. I also would love to be a student in your classroom where you can take a simple concept and segway into multiple topics including going outside and listening and learning from nature. Huzzah! I simply love the book that you choose. 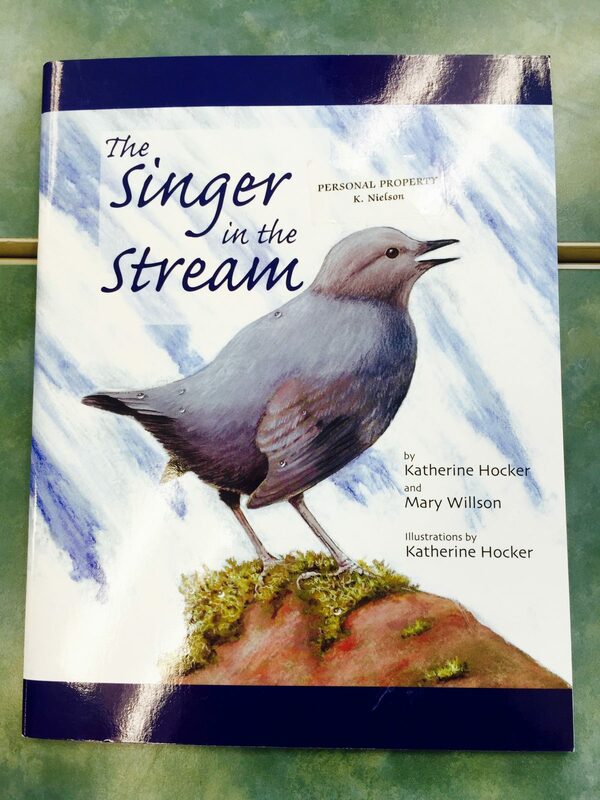 The Singer in the Stream by Katherine Hocker and Mary Willson, it’s a wonderful example that a story book can be used in so many subjects, including science. I remember reading about these mountain stream birds, that breed and nest close to waterfalls, and stream-side cliffs. I was intrigued by the fact that these birds can dive, and swim for as long as 30 seconds in search of caddisflies, fish, and salmon roe. The book can be the start of an outdoor activity for students to observe nature. Trying to code the natural world around us in musical terms is so meta!